The following are known or suspected of having been repainted not as their original models but as various Harry A. Smith models: Harris Visible / Rex Visible, Victor, Emerson, Burnett, National portable. 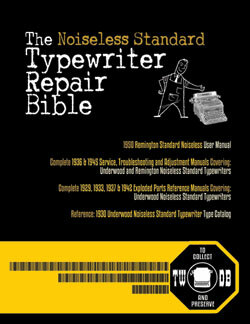 In 1905, the Franklin Typewriter Company began work on a $100 four bank frontstroke standard design developed mostly by J.A. Hagerstrom with the assistance of George W. Campbell and later contributions by William H. Hulse. This new design was intended to replace the then-new but already outdated No.10 Franklin. 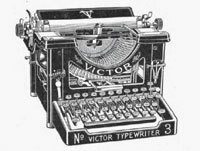 The new "Victor", which took its name from the predecessor to the Franklin, was manufactured and marketed by a newly formed company, Victor Typewriter Company, which was incorporated to absorb the interests of the Franklin corporation. No. 1 1907 Production of Victor begins in former Franklin Typewriter Company factory at 812-814 Greenwich Street, New York City. Victor No. 1 model advertised beginning May, 1907. "Diktator" model sold in Europe, has straight ribbon path. Forked-end double mounted typebars, zig-zag ribbon feed, Wooden key levers. 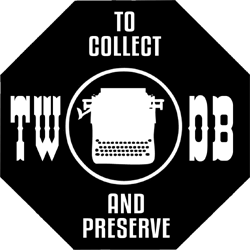 Decimal tabulator. No. 2 1909 Victor No. 1 model advertised. Wide-carriage option introduced. Victor No. 2 model introduced December 1909. 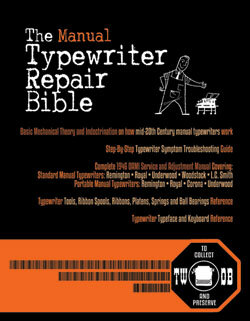 Zig-zag ribbon feed, ribbon color selector, backspacer, new carriage rail and bearings and escapement, variable line spacing, improved paper finger design, and adjustable key lever tensioner. Metal key levers began. 1910 Victor No. 2 model advertised. 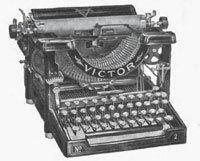 Victor Typewriter Company wins contract for 7,500 typewriters to be provided to International Correspondence Schools of Scranton, Pennsylvania in January, 1910. No. 3 1912 Victor No. 2 model advertised. Victor No. 3 model introduced March, 1912. Zig-zag ribbon feed, similar in design to No. 2. 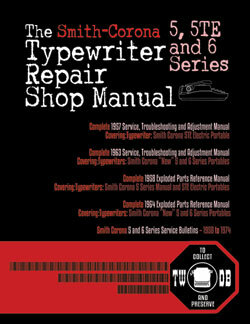 Platen length: 9.25", 42 keys and 8-key decimal tabulator. Sold for $100. 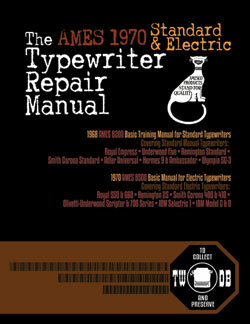 First patent: December 5, 1891 • last patent: November 3, 1909. 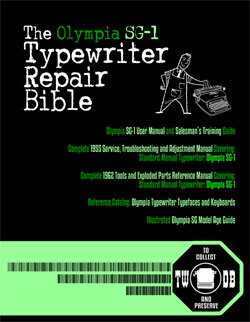 Sept. 1912: Robert J. Edwards sells Victor Typewriter Company to ICS affiliate International Textbook Company including all patents, tools, facilities and good will. 1915 Victor No. 3 advertised. 1916 Victor No. 3 advertised. 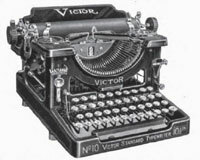 In 1916, Victor decides to sell some of its sales offices in smaller business areas and hand over the dealership rights to typewriter businesses already established in those locations. 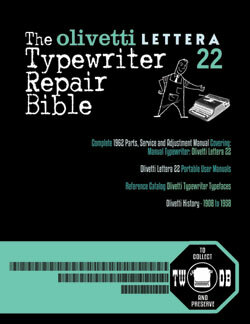 In England, Salter Typewriter Co. arranged to sell the Victor typewriter through its dealer network. 1917 Victor No. 3 advertised. Victor operations relocated to Scranton, PA. on May, 1917. 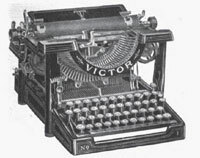 September 1917: Victor sets up Victor Typewriter Sales & Supply Co. to handle its rebuilt and/or traded in machines. This company was also located in Scranton, Pa.
May to December 1917: International Textbook and ICS reports loss of over 12,000 correspondence students as a result of the War. 1919 Victor No. 3 advertised. Victor No. 10 model announced November, 1919. No. 10 1920 Victor No. 10 appears January 1, 1920. Price is $110. 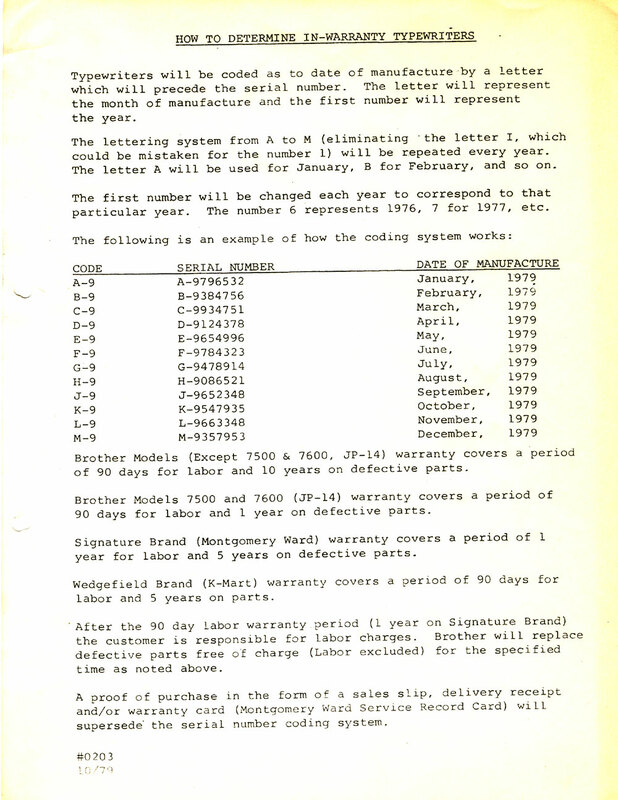 All known Victor 10's have serial numbers in a new 50,000 block. "Normalized" design changes: Conventional straight ribbon feed, spools on top. Re-oriented type basket, carriage assembly brought up and forward. 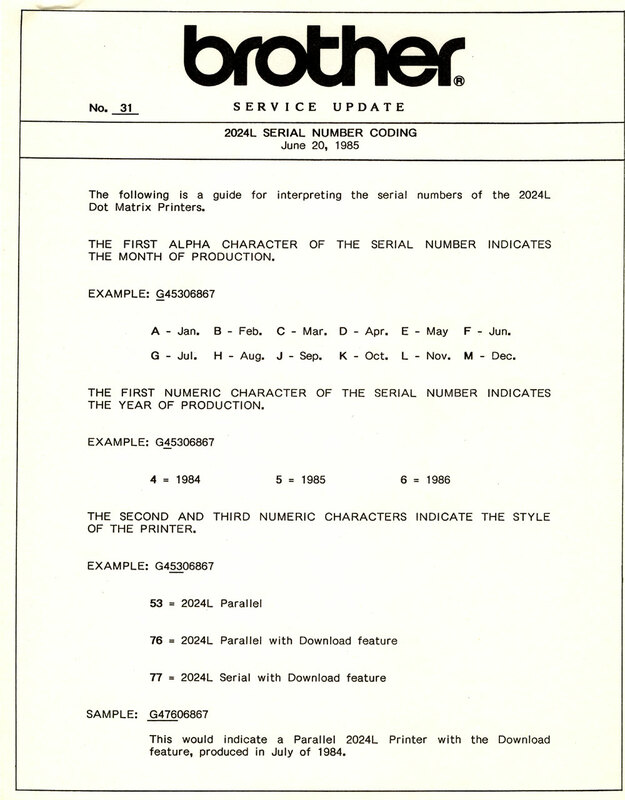 Decimal tabulator and ribbon selector quadrant retained. Patented: September 9, 1919. 42 keys. Platen width: 10 1/2" (labelled on right front frame and often erroneously thought to be the model number). 1921 Victor No. 10 advertised. 1922 Victor No. 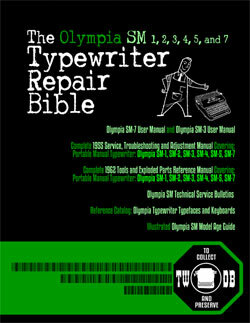 10 advertised heavily in Typewriter Topics through December 1922 (half-page ad for No. 10 in all 12 issues, Jan through Dec). Topics also reports a visit to the offices by Victor President Mayne R. Denman in February, banner sales for Victor in June (greater than any month for a year and a half, with sales 25% greater than shipments) and yet another visit from Denman in October where he states that he has "nothing to complain of". 1923 Victor No. 10 advertised. 1924 Victor No. 10 advertised. 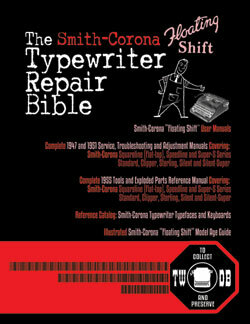 1925 References to Victor Typewriter can still be found in 1925 publications, but none have been found in 1926. 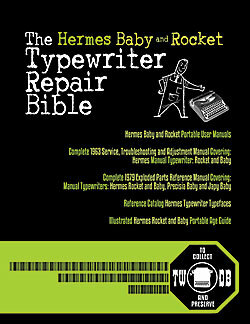 Victor Portable / Harry A. Smith 1926-1928 Victor sells right to manufacture and market typewriters under the name "Victor" to Victor Adding Machine Co. which briefly produced the Victor Portable for a few months between April, 1927 and early 1928. 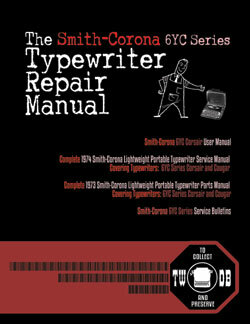 This design is mechanically unrelated to the Victor Typewriter design.